Mary McFadden, often described as a "design archaeologist," was influenced by the original design archaeologist, Mariano Fortuny. They both studied the past and borrowed from exotic Oriental and ethnic design. McFadden has "achieved effects redolent of the stylized characteristics of cloth seen in the art of ancient Greece" (Harold Koda). 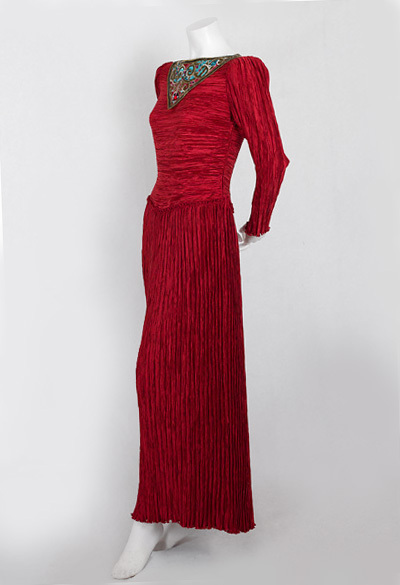 Her popular pleated designs have "Fortuny pleats," but there is an important difference. 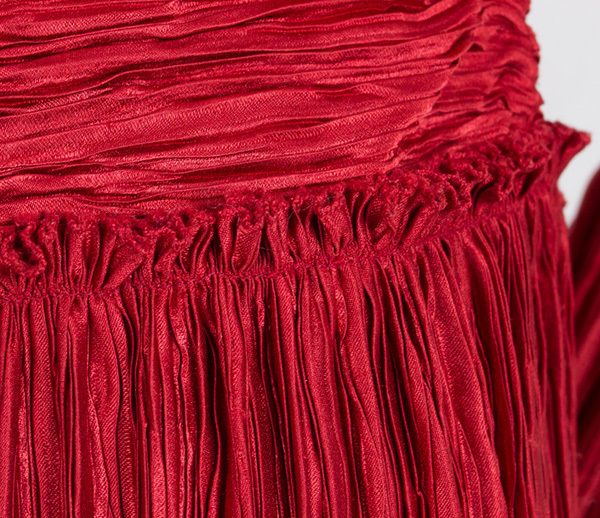 The McFadden pleats in polyester are permanent; the Fortuny pleats in lightweight silk need a bit of TLC to keep them tight. 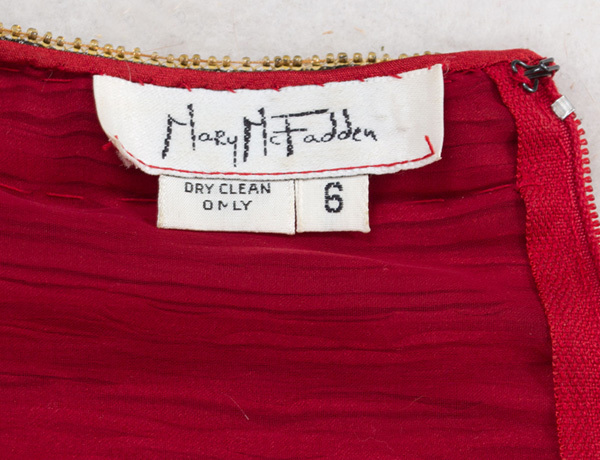 A McFadden pleated dress can travel anywhere in a suitcase and emerge unwrinkled and ready to go. 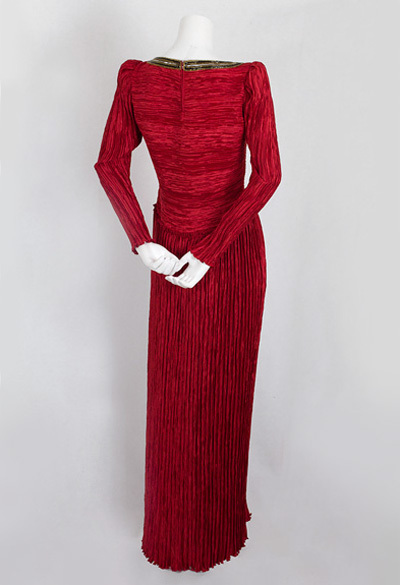 In his authoritative book Goddess: The Classical Mode, Harold Koda of The Costume Institute writes: "Although the secret of Fortuny's miraculous pleats died with him in 1949, their spirit has been revived over the years, most recently in the designs of the hieratic Mary McFadden..."
The rich cranberry red of the labeled dress is intensified by the texture of the pleating. 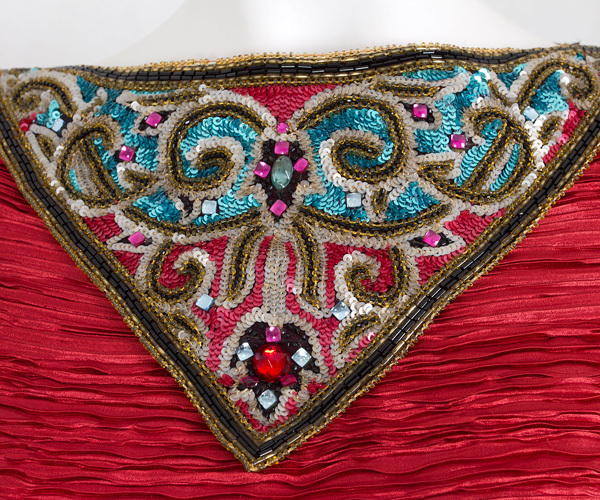 The neckline is accented with a bib panel of multi-colored beads and sequins. 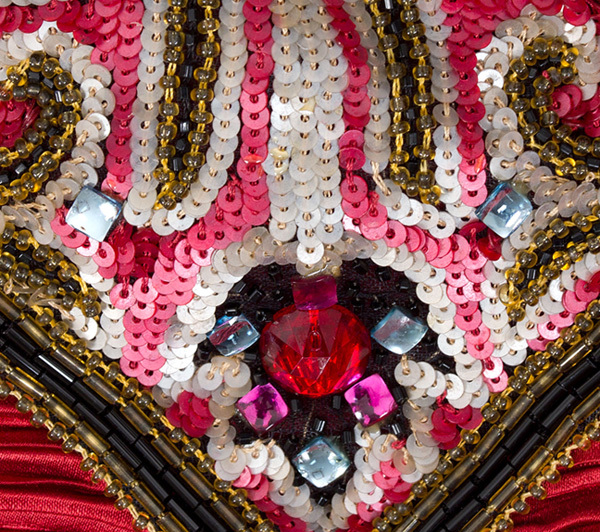 The bodice is lined with matching cranberry georgette. 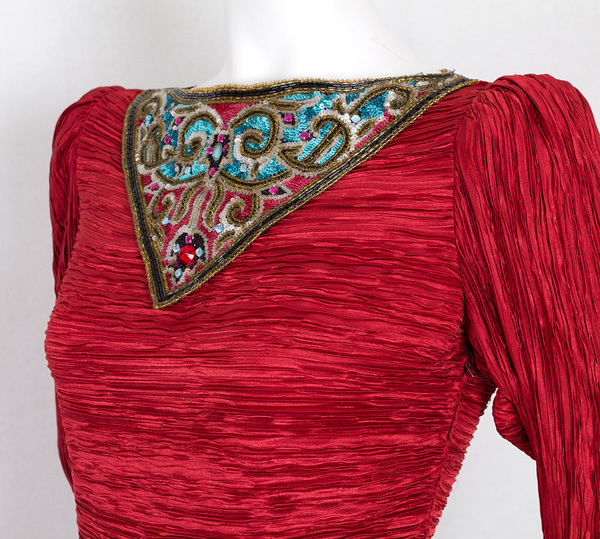 The dress is beautifully finished with two hand-stitched zippers: one is on the side; the other is at the back neckline. Red is the most chromatic, saturated basic color; thus, it is the pre-eminent hue. 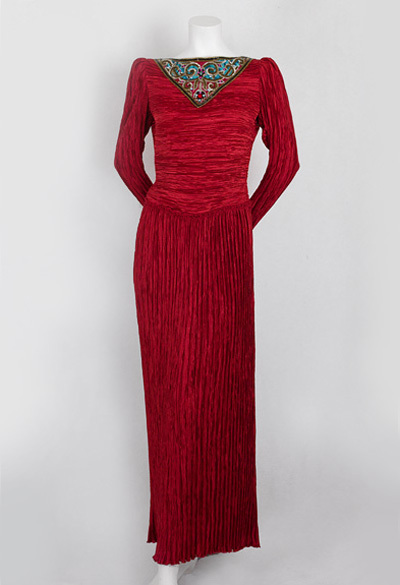 The vibrant red of the clinging dress will raise the temperature of the room as you make your entrance. Like a moth circling a flame, men can help themselves. They are drawn to the electric excitement of this thrilling red. The condition is excellent and wearable. The dress looks like it was never worn. 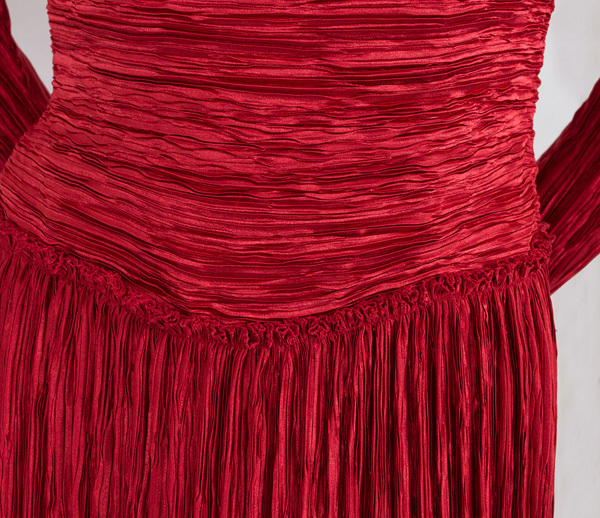 It measures: 36" bust, 28" waist, 40" hip, 14 1/2" from shoulder seam to shoulder seam, 23" sleeve length, 17" from the shoulder to the drop waist, and 55" from the shoulder to the hem.